Funny Christmas Books That Will Make Boys Go Ho, Ho, Ho! If you and your boys love Christmas, and reading, and books, this list is perfect for you! Try these Funny Christmas Books for Boys and you will all have a great time, reading, laughing and creating memories together. We have a large plastic bin of Christmas books that we pull out and read each year. Every year as my son was growing up I bought Christmas books. I sought out the books we used to read when I was a child and found new titles as well. We have quite the collection now. There are funny ones too and they have always been a favorite. Enjoy this list from our best books for boys series and let me know if you have any books you would add to it by leaving a comment below. I have found that boys really enjoy funny books and am putting together some great “funny” book lists for you. See the other lists at the bottom of this article. Let’s start of with one I know boys are going to love. A Pirate’s Night Before Christmas is silly, funny and an all around good book to get them thinking pirate – you know with visions of treasure chests and a “santa” with 8 giant seahorses. Another hit by the author who wrote the book above, this time in the style of the 12 Days of Christmas, is A Pirate’s Twelve Days of Christmas This guy really knows his pirates! This is a fun one for pirate fans. If your boy leans more toward knights than pirates try The Knights Before Christmas . There is an invader that must be stopped but little do the knights know it is Santa Claus! This is a tough one to describe but if you think sassy elf, Santa knocked out cold, Murray the Jewish deli owner to the rescue and some very amusing rhyming lines you about have the idea of this book. Click through to take a peak inside: How Murray Saved Christmas . Yes, it is unusual! Bad Kitty is up to her sassy antics again in A Bad Kitty Christmas She starts off just a tad greedy but in the end learns the true meaning of Christmas and we enjoy the amusing way this comes about. What would it be like to have a dinosaur in the house for the holiday season? Find out in How Do Dinosaurs Say Merry Christmas? . Jane Yolen’s How do Dinosaurs . . . series is a winner! Christmas is my favorite holiday and spending time reading with my son is something I always make sure we have time for. I hope you will make the time to do the same with your boys. 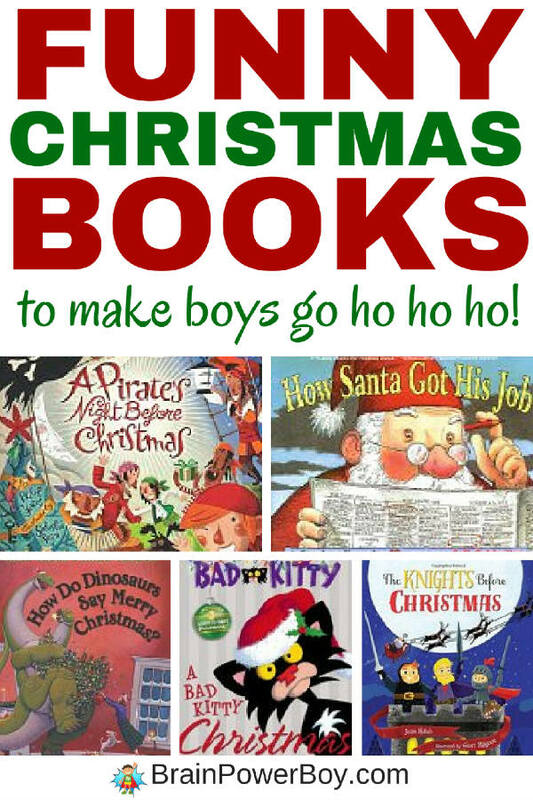 Try a few of these funny Christmas books for boys, cuddle up on a cold winter day and read, read, read! If you enjoyed this Funny Books for Boys list be sure to try our other funny book lists: Funny Poetry Books, Funny Halloween Books for Boys, Funny Pirate Books to Make Boys Laugh, and Funny Valentine’s Day Books for Boys. This is fantastic! I was just looking for Christmas Books to read to the kids. I’m adding these to our list! Sharing and Pinning! ? Just a heads up on the Bad Kitty one. Parents should be aware that Aunt Pam and Her Partner Patti are attending the Christmas party.